President John F. Kennedy makes his "moon speech" at Rice University in Houston on Sept. 12, 1962. Fifty years ago today (Sept. 12), President John F. Kennedy whipped up support for NASA's fledgling Apollo program in a speech that contains perhaps the most famous words he ever uttered about space exploration. Kennedy's stirring, soaring "moon speech," delivered at Rice University in Houston, laid out why the president believed sending astronauts to Earth's nearest neighbor by the end of the 1960s was so important. Kennedy had first aired that ambitious goal in May 1961, just six weeks after the Soviet Union's Yuri Gagarin became the first human to reach space. The Rice speech marked a key moment in the trajectory of the Apollo program and space exploration in general, experts say. Kennedy's vision came true, of course. On July 20, 1969, late astronaut Neil Armstrong stepped onto the lunar surface. Four days later, he and his two Apollo 11 crewmates splashed down safely in the Pacific Ocean, wrapping up a huge victory for the United States over the Soviets in the Cold War space race. Kennedy made the Rice speech during a tour that also stopped at Houston's Manned Spacecraft Center (now known as Johnson Space Center), the Launch Operations Center in Florida and Alabama's Marshall Space Flight Center — NASA sites that would be key to making Apollo a success. The president wanted to give the Apollo program a boost and help explain to the nation why it should be such a high priority, said space policy expert John Logsdon, a professor emeritus at George Washington University. "There were controversies over how much money to put into Apollo, and, indeed, even whether to continue it," Logsdon told SPACE.com. "He wanted to indicate his strong support for the program, and this [speech] was the chance to do it." At Rice, Kennedy stressed that humanity's charge into space is inexorable, and that the world would be better off with the United States leading the way. "For the eyes of the world now look into space, to the moon and to the planets beyond, and we have vowed that we shall not see it governed by a hostile flag of conquest, but by a banner of freedom and peace," the president told 40,000 people in Rice's football stadium that day. "We have vowed that we shall not see space filled with weapons of mass destruction, but with instruments of knowledge and understanding." Kennedy viewed winning the space race as key to keeping the United States ahead of the Soviet Union technologically and militarily, as his next words make clear. "Yet the vows of this nation can only be fulfilled if we in this nation are first, and, therefore, we intend to be first," he said. "In short, our leadership in science and in industry, our hopes for peace and security, our obligations to ourselves as well as others, all require us to make this effort, to solve these mysteries, to solve them for the good of all men, and to become the world's leading space-faring nation." 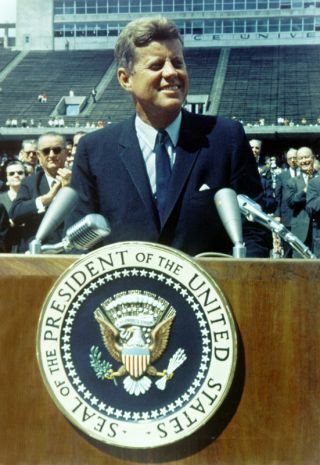 In perhaps the speech's most famous passage, Kennedy acknowledged the difficulty of Apollo's quest but argued that a challenge brings out the best in the United States. The federal government did indeed make Apollo a national priority, pouring an estimated $25 billion — well over $100 billion in today's money — into the program. In 1966, NASA funding represented 4.4 percent of the federal budget, compared with less than 0.5 percent last year. The space race is over now. The Soviet Union no longer exists, and its descendant state, Russia, is now a key spaceflight partner of the United States. But Kennedy's words of 50 years ago still have the power to inspire today, as celebrations of the speech's anniversary show. And while the president's Cold War rhetoric may not be so effective today, other passages of the speech may get people's space-exploration juices flowing again. "The question for today is whether the other rationales are enough to sustain support for the [space] program," Logsdon said.